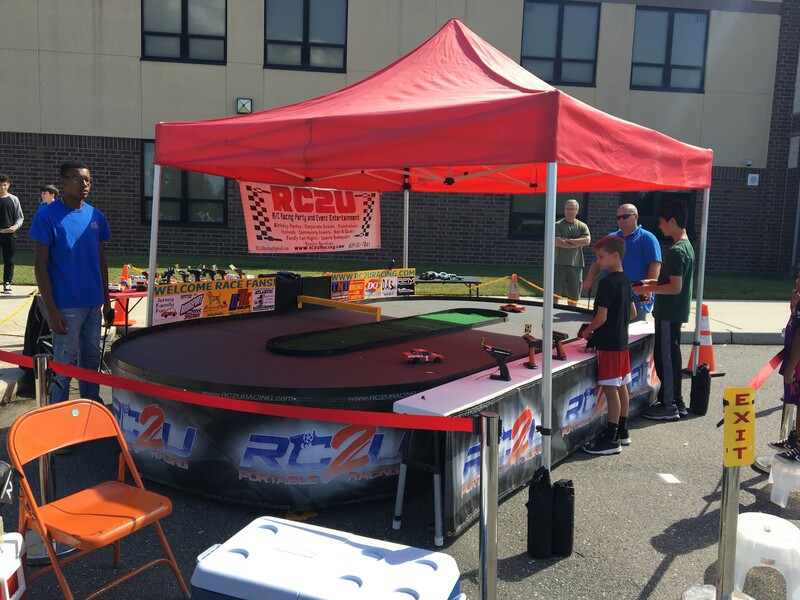 EGG HARBOR TOWNSHIP ¾ The roar of 5HP diesel engine revving up every ten minutes on Saturday drew kids to Egg Harbor Township High School’s Electrical Technology Teacher Etzel Brower’s display to flip the switch-wired ignition circuit. Once there, they were able to see first-hand how a 150-amp circuit breaker panel and a 4-stroke engine work, and test out a solar-powered USB charger. Across the parking lot, the district’s Español para Hispanohablantes program, a NJDOE-recognized World Languages Model Program, was being introduced to visitors, while Eagle Greenery students – showcasing their award-winning floriculture academic program at the high school – were selling fresh-cut flowers. Saturday’s #EHTPride Festival was all about Egg Harbor Township and what sets the local public school district apart, both academically and as a community. There was something for everyone at the inaugural event, co-hosted by the Egg Harbor Township Education Foundation and Community Partnership for Egg Harbor Township Schools, Inc.
Held in the Egg Harbor Township High School parking lot from 11 am – 4 pm and showcasing more than 100 academic, extra-curricular, athletic, performing arts, and school fundraising activities, the festival featured a free bounce house, laser tag, RC2U portable remote controlled 24’ x 20’ car track, a basketball hoop, rowing machines, a giant checker board, face painting, temporary tattoos, bowling, hands-on games for kids, and six food trucks including: Asian Street Cravings, Bare Knuckle Café, Ken’s Ice Cream, Kona Ice, Pirate Pete’s Soda Pop Co., and Wipeout Eats. The Bargaintown Fire Co. brought a ladder truck, the 177th Fighter Wing arrived with a Humvee, and the district provided a school bus for up-close and personal viewing. Also represented were Atlantic County Utilities Authority, The Hero Campaign, Stop The Heroin, EHT Police and Recreation Departments, EHT Nature Reserve, and Greate Egg Harbour Historical Society. Senior Ambassador students lead high school tours of the renovation project completed in 2009 that added dozens of new classrooms, expanded science labs, and a new gymnasium, auditorium/performing arts center, and cafeteria for the largest district in Atlantic County. Attendees also had the opportunity to visit the sports stadium complex while attending varsity and JV athletic events, and take in the massive outdoor makeover that added an artificial turf field, new track, expanded bleacher seating that tripled the seating capacity to 3,000 people, new tennis courts and fields for the javelin throw, long jump and pole vault. The Festival preceded the district’s annual band competition which started at 6 pm and feature 17 high school bands. For more information about EHT Pride Festival, please call (609) 646-8441 ext. 1017, or via email to gregorye@eht.k12.nj.us.